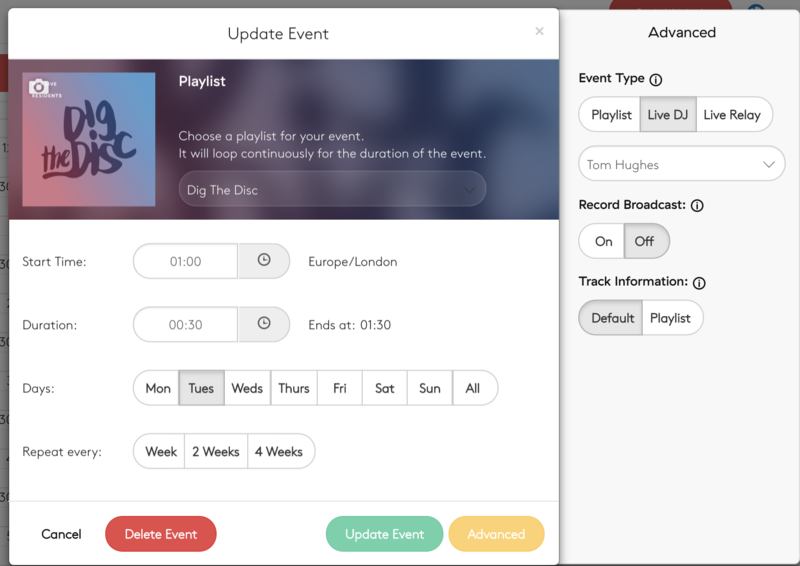 With radio.co, live shows are managed conveniently on the Schedule tab alongside automated playlist content. To Schedule a live event, go to the Schedule tab within the Radio.co dashboard. Note: The schedule is presented in a weekly calendar view showing the current week by default. You can advance the weeks using the buttons at the top if you wish to schedule a one off live event in the future. Click and drag on the calendar at the point you wish to schedule the event. If you are scheduling a repeating show, select the days you want the event to repeat on. This will add them on the selected days every week indefinitely on the calendar. Review the summary then click Update. The Live event is now scheduled. When the DJ logs into Radio.co they will be presented with the Live DJ bar within 1 hour of their slot beginning. This includes all the connection information for their chosen broadcast software. Please refer to our Software guides in this support category for setup instructions. Live Anytime allows the Station Owner to connect to their radio station at any time without having to schedule an event. To learn more about this, click here. Ensure your schedule is clear. Click 'ALL' under repeat options so all days are highlighted. This will allow 24/7 access to Radio.co for one DJ user. If they are disconnected, the system will fall back to your default playlist.